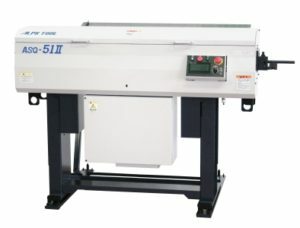 ASQ-51Ⅱ is the bar feeder for short materials only. This is improved version of ASQ-51 and has been improved in basic performance, user-interface, and durability of the body. This will surely contribute to cost reduction by using remnants and to the stable operating using oil-pan system and compatibility with IP54 under the severe environment. Immediate advance after the first introduction shortens time for exchange of materials. Feed performance has been risen owing to the latest motor control. 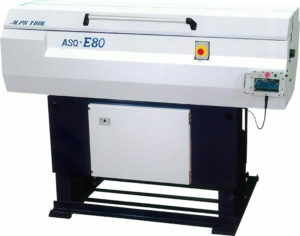 Sliding device is equipped as standard and it makes change spindle liner of CNC lathes easier. However,the length from lathe spindle rear end to top cut position is the maximum. ASQ-E80 is the air less type bar feeder for multi kind small/ medium volume production equipped with automatic programming system. This is the one to meet needs for demonstrating 100% of high performance and high accuracy of NC lathes and unmanned continuous machining that produce completed products directly from bar materials. Automatic programming system reduce time for set-up change. Automatic adjustment of a material extraction position. Automatic adjustment of a material installation guide position. No vibration nor noise occurs while machining because the feed pipe is separated from a material. Easy to use and later installation since it occupies only small area. Built-in various self-diagnosis functions including random length material measurement realize safe unmanned continuous machining. 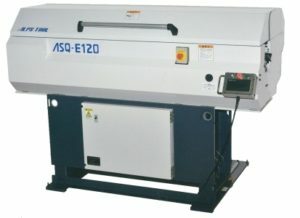 ASQ-E120 is the air less type bar feeder for multi kind small/ medium volume production equipped with widely adjustable V-guide for material feeding. This is the one to meet needs for demonstrating 100% of high performance and high accuracy of CNC lathes and energy-saving unmanned continuous machining. Noiseless factory environment can be realized owing to quiet loading.